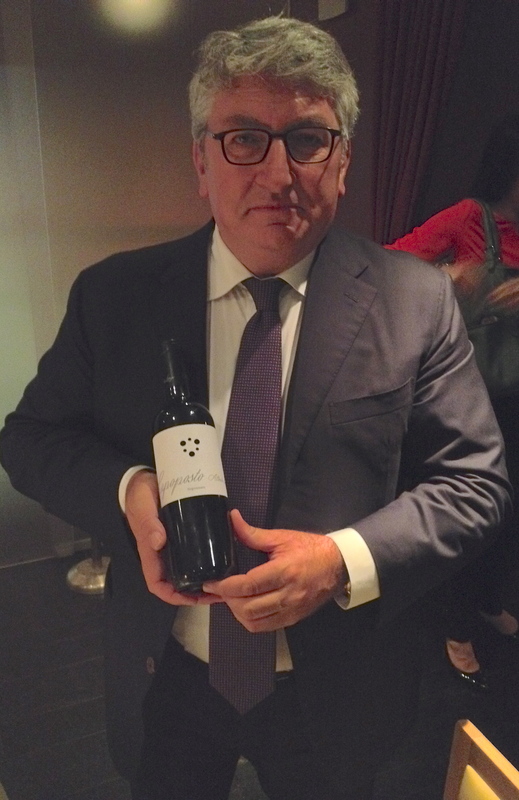 At a recent tasting and dinner at SD26, I was very impressed by the wines of Alberto Longo. I have known Alberto and his wines for a number of years, but something seemed different. I asked Alberto if the winemaker was the same or if he made any changes in how the wines were made. He said that the winemaker was still Graziana Grassini and she is making the wine the same way. 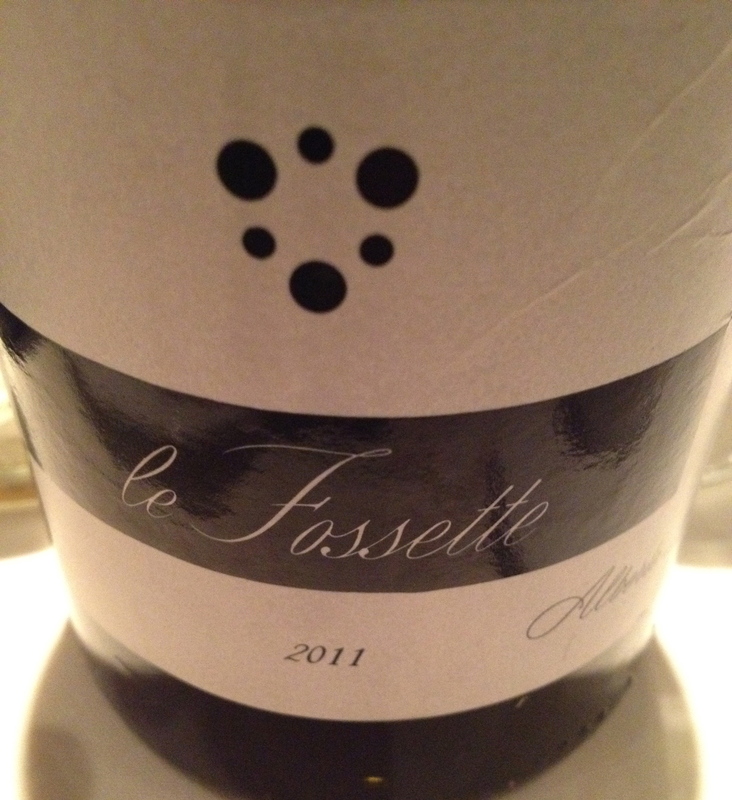 He added however that the wines were better because his vines were now 12 years old and this made all the difference. He also said that he does not like to use new wood for aging his wine. It hides the true character by adding aromas and flavors that do not enhance the wine but distract from it. Only three of his wines see wood and it is second, third and fourth passage barrels. The Alberto Longo winery is located in Lucera, in northern Puglia, and there are 35 hectares of vineyards around and near the winery. Alberto is very proud of his region, especially the food and wine. 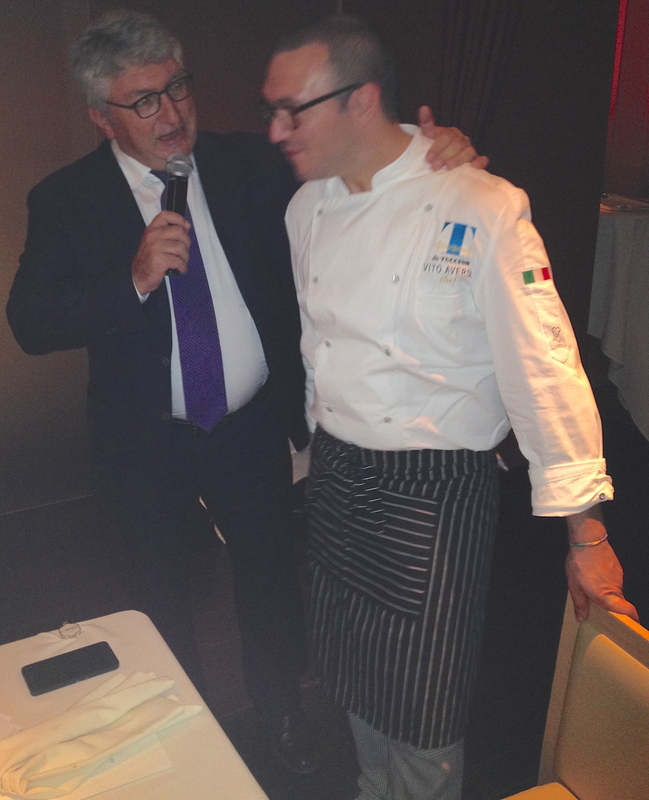 For this tasting and dinner he flew in Vito Centrone, the young owner of restaurant da Tuccino near Bari, and his chef Vito Aversa who prepared the food with the help of the SD26 staff. IGT Puglia Bianco “le Fassete” 2011 made from 100% Falanghina. The production area for the wine is San Severo and Masseria Celentano in northern Puglia. The vineyard was planted in 2002 and the soil is calcareous clay loam. There are 5,600 vines per hectare. After a soft pressing the grapes are de-stemmed. Alcoholic fermentation takes place in stainless steel tanks at controlled temperatures. The wine remains on the lees for three months. Alberto wanted to show the current vintage 2012 but was sent the 2011. For me this was the better choice because the wine had an extra year of aging and had developed more character. Italian white wines can age and Alberto said he has older vintages at the winery. The wine was a perfect combination with the fish crudo. It has a fruity and floral bouquet. It is full bodied with hints of citrus and good acidity. 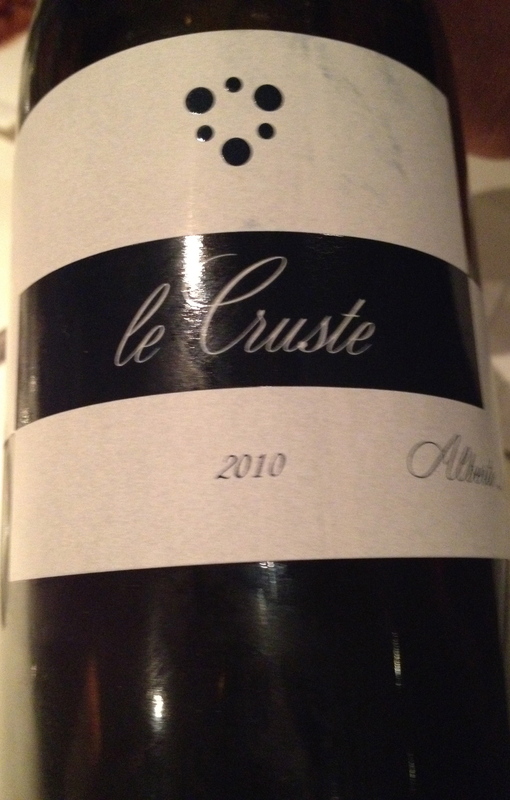 Puglia IGT Rosso “le Cruste” 2010 made from 100% Nero di Troia. Type of soil is calcareous clayey texture. Fermentation in stainless steel with prolonged skin contact. After malolactic fermentation the wine is aged in French barriques (second and third passage) and in casks for at least 12 months, then at least 18 months in bottle before release. This wine had flavors and aromas of blackberry and plum and a touch of spice. 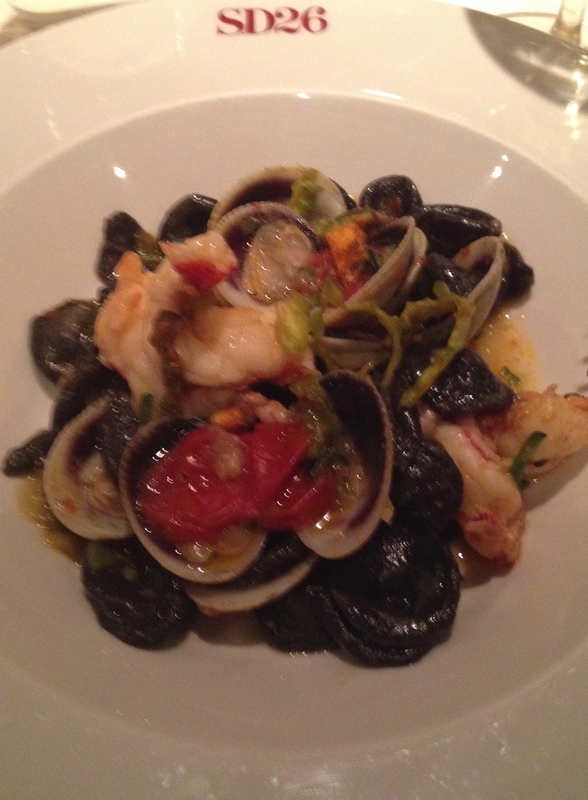 It was served with fresh black squid ink orecchiette in a sauce of clams, red shrimps and zucchini flowers. 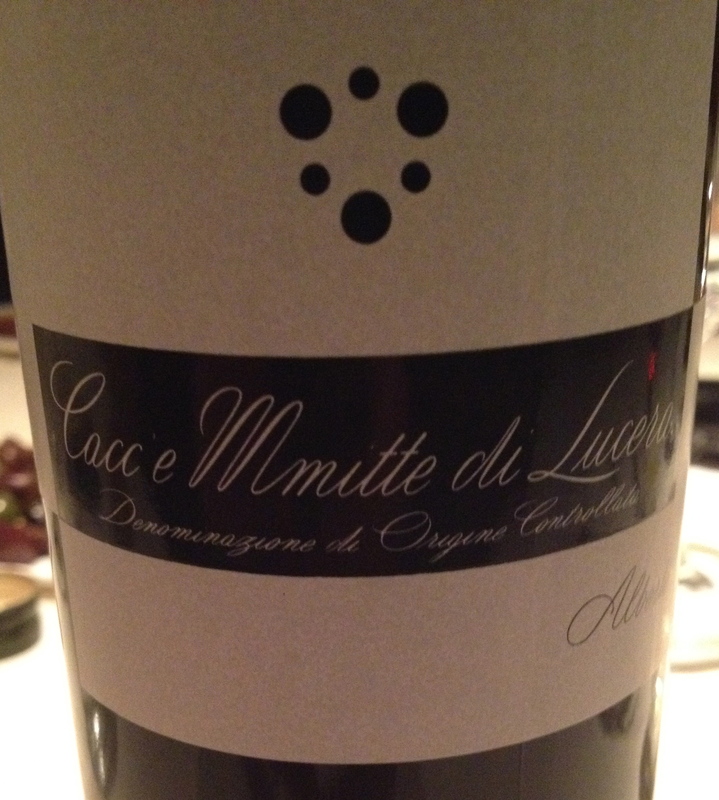 Cacc’e Mmitte di Lucera DOC 2012 made from 55% Nero di Troia, 30% Montepulciano d’Abruzzo and 30% Bombino Bianco. The soil is calcareous with sandy topsoil. There are 5,600 vines per hectare. Viniflcation takes place in stainless steel tanks at controlled temperatures with prolonged maceration on the skins. Malolactic fermentation takes place in November. The wine is aged in cement tanks for at least 6 to 8 months and it bottle for at least 6 months before release. Alberto said that this appellation had been nearly forgotten. He helped to support it along with its principal grape Nero di Troia, aka Uva di Troia. The wine has aromas and flavors of berries such as blackberry and blueberry, and a touch of violet. Oven roasted wild turbot with a potato crust, fresh tomatoes, parsley and garlic was the accompaniment. 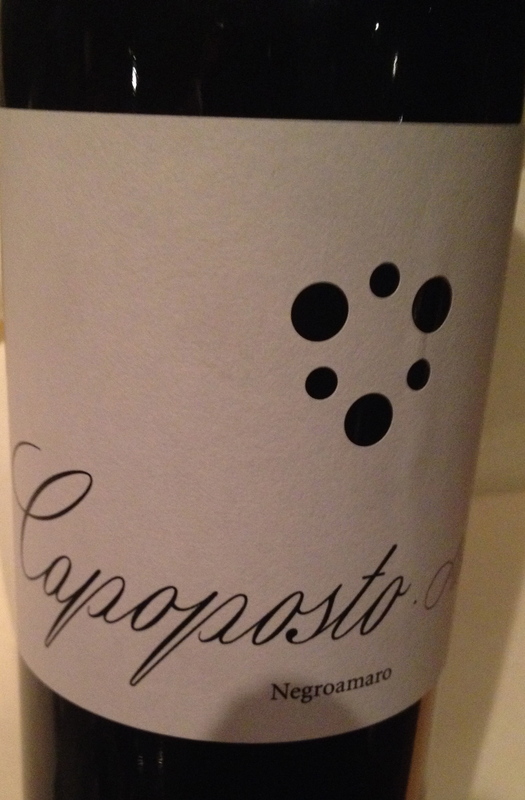 IGT Puglia Rosso “Capoposto” 2012 made from 100% Negroamaro. There are 5,600 plants per hectare. Vinification is in stainless steel tanks at controlled temperature with prolonged skin contact with the must. Malolatic fermentation takes place in the month of November. Aging takes place in concrete vats for at least 6 to 8 months and in bottle for at least 6 months before release. This is a wine with aromas of red and black berries. It is a medium to full bodied wine with a long finish and nice aftertaste. Served with Fassone Piemontese rib eye with braised endive and radicchio.